I have been inking on vellum (Vidalon Translucent 55 LB) for over 30 years. Its transparency allows for the art to be completed by working directly over the top of my finished sketch, a time saver instead of transferring the drawing to another surface. The paper has a welcome tooth for inking and can be corrected carefully with erasure with a surgical blade or X-acto knife or repaired by re-inking a section of the drawing and replacing it with what is cut out of the original drawing-the scotch-taped repair on the drawing's reverse is not evident in final art scanning. In my pen and ink approach, fewer lines inhabit the periphery of the drawing leaving the white of the paper--minimal lines describe the outer boundaries as landmarks and anchors. Weighted or accented lines provide an organic and plastic look to the illustration's contents. The greatest concentration of tone is found in the center of the drawing for emphasis-the drawing's focal point-"keeping one's eyes on the prize." Each of these concepts will become clear in the following examples. Varying the thickness of the lines and their placement side-by-side displays a framework for tone and the surface texture of each leaf in "Sunflower Visitors." By selectively leaving out lines, the white of the paper provides highlights to the leaves as well. Thick accents in adjoining lines of the leaves, also referred to as "snodgrassing," provide further depth and a plasticity clearly evident in the close-up. 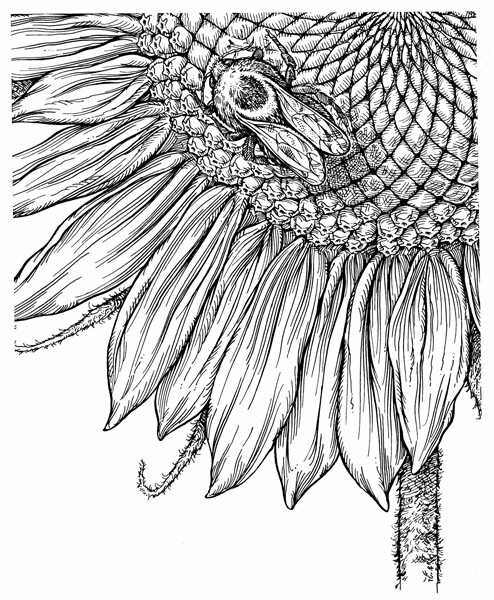 A variety of line treatments including crosshatching and short lines create tone and texture throughout the drawing. 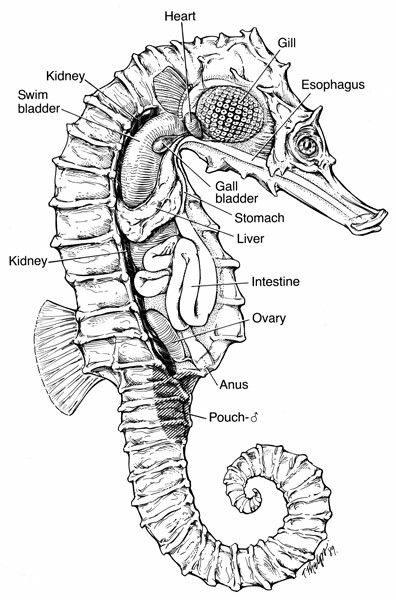 Thick accents in the outline of the drawing of the Seahorse provide the framework for the establishing the undulating texture of the specimen and frames the transparent interior anatomy displayed. Thin lines drawn on the "light side," illustrating the drawing as if lit by an upper left hand light source, are paired with thicker lines on the "shadow side"-or the lower right side of each structure. A variety of line treatments: stipple, accented lines, "scratch-back" with a knife in painted black areas and squiggly lines and dots each give a life and color to the variety of textures found in individual organs. Remember to explore the power of making a variety of marks with the pen. Bold outlining provides focus in the "Hair Follicle." Simple lines are used to identify the subcutaneous fat and the cellular networks that make up the skin and shaft. Finely spaced lines provide depth and tone in the shadows and recesses of the sebaceous gland sacs. 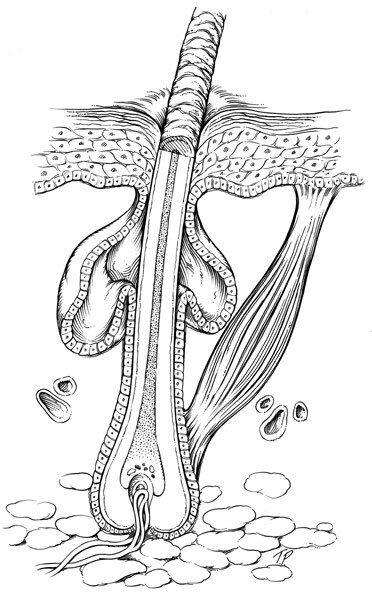 Long straight parallel lines establish the body of the erector pili muscle. 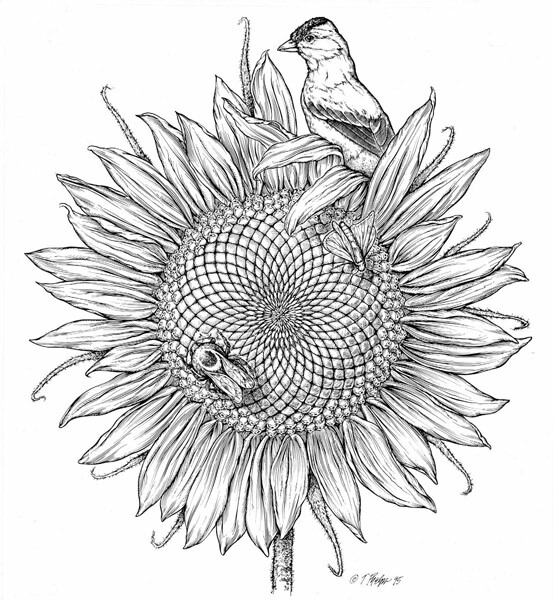 The white of the paper is evident throughout the illustration. Over-rendering with multiple lines throughout the entire image creating layers of tone defeats the purpose of story telling and communicating the message of individual parts. Retaining the white of the paper surrounding the image also provides an area to add appropriate identifying labels and leader lines. Finally, minimal rendering also provides a time saving device- this drawing was a part of a body of work consisting of over 500 images sketched and inked in a single year. In "These Guys Wail" our animated and frenetic jazz musicians are treated in a chaotic line to mimic the energy of their musical pursuit. Swirling lines abound! I encourage each of you to explore pen and ink and all the marks that can be made and find your own voice. Look at your own drawing style and the styles of others-identify the line treatment that speaks to you and adopt those characteristics in your pen and ink approach. Practice, practice, practice! Do not be afraid of the media-embrace it and most of all--have fun. Tim Phelps, MS, (University of Michigan '81) FAMI, Associate Professor, Medical Illustrator, Johns Hopkins Art as Applied to Medicine, Baltimore, Maryland. Tim is a Past President and Past Chair of the Board of the Association of Medical Illustrators. He has been illustrating medicine and science for 30 years with work appearing in over 60 surgical textbooks and atlases, over 200 book chapters and journals, and over 20 magazine titles. He was the Art Director and primary illustrator for the Johns Hopkins Family Health Book (Harper Collins, 1999) creating over 500 illustrations for this publication. 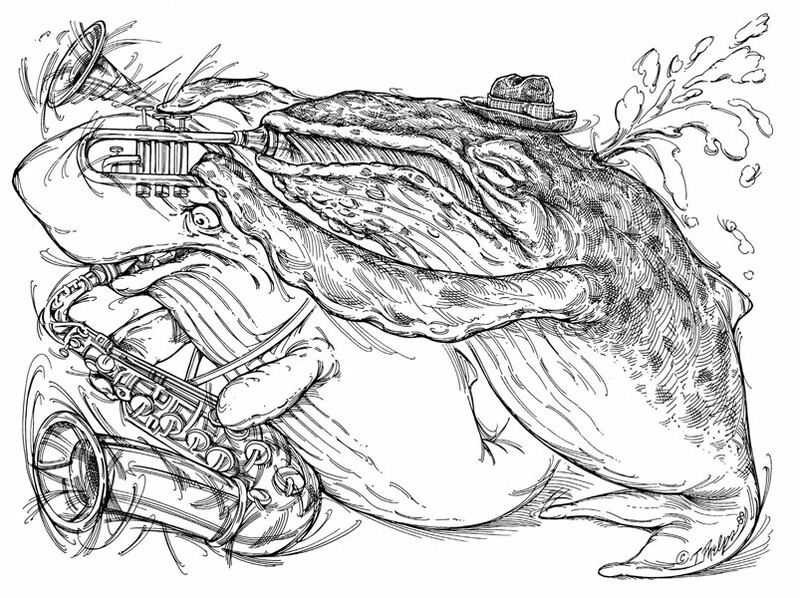 Merriam Webster Dictionaries commissioned him to create over 600 illustrations in 2007. His work has been regionally and nationally awarded over 40 times. He is also the author of Up in Flames: The Art of Flame Painting (MBI 2006) and recently designed flamed fish and fowl for the Hawaiian shirt company-- Paradise on a Hanger. Most recently, he is the series artist/designer for Greenlight Collectibles "Up in Flames" series of 6 flame painted die-cast cars, available at Target Stores nationwide in November.